Social Entrepreneur - What Would You Do with 400,000 Swiss Francs? The world’s population continues to expand. According to the UN, more than 9 billion people will live on the planet by 2050. Along with improvements in life expectancy, there are many more mouths to feed. Access to good nutrition, safe water sources and economic opportunities are needed to meet the challenge of our growing population. Innovative solutions will enable us to tackle poverty, disease and malnutrition. Harnessing the power of private enterprise to tackle social challenges with business solutions is what we call Creating Shared Value (CSV). It’s a philosophy that has long driven our decision making at Nestlé and is reflected by our company purpose of enhancing quality of life and contributing to a healthier future. We’ve also spent time finding and supporting entrepreneurs who exemplify Creating Shared Value through their business ideas and actions. Harnessing these innovations will put new solutions on the table and, at the same time, help spread wealth and prosperity. 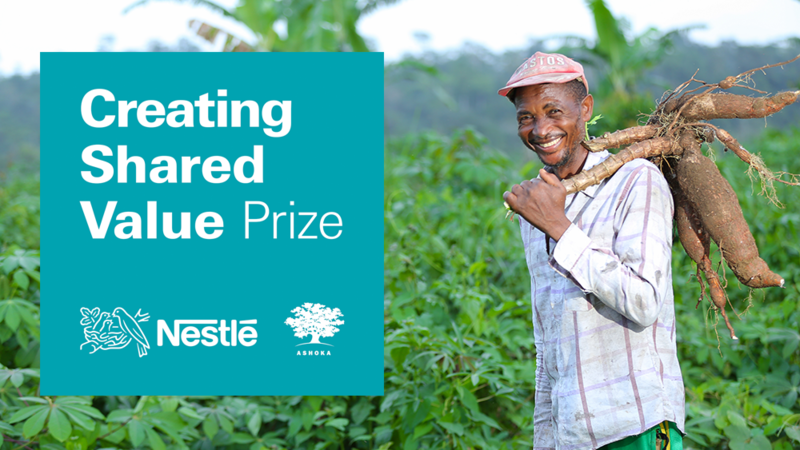 To recognise and promote the work of pioneers in this field, we launched the Nestlé Creating Shared Value Prize in 2010. Today we launch its 2018 edition. This year Nestlé has partnered with Ashoka, the world’s leading network of systems-changing social entrepreneurs. Together, we’re looking for individuals and businesses who are scaling up or generating new business models in the areas of nutrition, water or rural development. We are also pleased that this year for the first time, the Henri@Nestlé open innovation platform will be our network partner to amplify the outreach to participants. As the world’s largest food and beverage company, we’ve been involved in many different projects to help boost capacity and generate business opportunities. These range from adding micronutrient fortification to our products to engaging in farmer training programmes with our suppliers. Our Creating Shared Value prize pool is similarly wide ranging – seeking entries from different sectors and geographies. Winners this year will receive up to CHF 400,000 in funding for their enterprise or a lifetime Ashoka Fellowship to scale up or replicate their initiative. Shortlisted entrepreneurs will participate in the 2018 World Water Forum in Brazil, pitching live to the Nestlé Creating Shared Value Council. Capturing and promoting these breakthrough ideas will allow them to flourish. Through the Creating Shared Value Prize, we hope to profile the power of innovation, showing how the right approach to business can deliver commercial success along with greater returns for society as a whole.